Joe Linton is a gardener, an activist, and a artist. Another label important to him is something that most people would overlook: Linton is also a resident. He is a resident of Los Angeles, and that influences where he gardens, who he fights for, and what he draws. For most of his adult life, Linton has felt a calling for an activist’s life. Linton is often in combat with government officials and city planners over something in his city he lives to protect. Sometimes he comes out like a hero, and other times he is a non-profit nuisance. When he’s not busy saving the gray, drab urban spaces of LA, Linton is the model neighbor anyone would want—warm, inviting and helpful. Most Saturday afternoons, he can be seen in his garden. He is a resident of Eco-Village, a small community in the middle of Koreatown in Los Angeles. Linton is 6’3 with a heavy build, but he is anything but intimidating. In fact, he mostly personifies the ecological artist Eco-Village tends to attract. The bald forty-seven year old man’s common uniform is horn-rimmed glasses a T-shirt advertising his nonprofit, khaki shorts, and Teva sandals. He always carries around a sketchbook. He rarely drives a car, and hasn’t owned one in about 20 years. Linton was one of the first to move into Eco-Village in 1996. He liked the idea of joining a small community of people interested in environmental issues and sustainability. There is no hierarchy in Eco-Village, and each member lives his or her own life, aside from participating in the non-mandatory weekly meeting and potluck. Eco-Village residents total about 50 people. They live on a small street of a multi-ethnic working class neighborhood in Koreatown. Located three miles from downtown LA, two blocks west is the Rockwood gang, and eight blocks east resides another gang. Eco-Village is a small community situated behind a Vons, across from a junior high school and down the street from a Korean church. Black spiral designs adorn the sidewalk in front of the entrance of Eco-Village. At first glance people may take it as a whimsical abstract piece of self-expression. What it really is, however, is an effort to disguise some graffiti. Across the country, Eco-Villages are urban or rural communities with the goal of integrating a supportive social structure with a low-impact way of life into the local environment. The original idea for an Eco-Village in LA came from a woman named Lois Arkin, who is executive director of the non-profit Cooperative Resources and Services Project (CRSP), which helped begin the process of buying an apartment building to serve as the base of LA’s Eco-Village. Every resident has his or her own life and job outside of Eco-Village, but they enjoy coming home to a place filled with people who have the same sustainability goals and ideals that they do. The Eco-Village building is a faded yellow color, with mission-style arches and windows with green trimming. It was built in the 1920s, and then it was used as a residential hotel for rich celebrities who came to the area for a little rest and relaxation at the Bimini Baths hot springs. The building is ancient by California standards, giving Linton’s residence a kind of old-world, funky vibe. The thing that really sets Eco-Village apart from its neighbors, however, is the green foliage in the front yard—full and lush, yet carefully maintained as to not look overgrown. It is a small urban oasis in the middle of a gray city. Around the back of the Eco-Village apartment buildings is a gate built out of old bicycle parts that have been painted over. A non-profit called Bike Kitchen used to be based out of a room in the Eco-Village complex, and many of the bikes they had weren’t good for anything but junk piles. Linton and some members of Eco-Village hired a company to build a steel frame, and took parts of around 20 different bikes and welded them together to make a gate for the backyard. The gate is a web of metal pieces radiating out from multiple bicycle wheels placed throughout the design. It is painted in a bright, bold rainbow of colors, and its makers have since named it “Multiple Centers of Initiative,” as a nod to the general philosophy of Eco-Village. It represents the belief that any member can initiate a project that interests them, without waiting for permission or dealing with bureaucrats. Citizens have always tried to make their mark on cities—take the popularity of graffiti for example—but most of the city planning is left up to professional planners and officials. Yet, as Linton says, it’s human nature to look around one’s surroundings and think about how something could be better. Generally, urban spaces are aesthetically unpleasing and sometimes downright inconvenient. A growing movement across the world involves citizens who are starting to take things into their own hands by altering public spaces for the common good. They install public benches at bus stops, paint their own bike lanes, and even reclaim entire intersections. It is graffiti with a purpose; a graffiti that helps make a city more livable. Linton and his fellow Eco-Villagers have embraced this philosophy and put it into action. In 2009 a man named Mark Lakeman from an organization called City Repair, which is based in Portland, Oregon, visited Eco-Village and inspired its residents to create an intersection repair project. For years Linton had spent a lot of time trying to convince local governments to support urban environmental projects. Lakeman showed him that a different approach—taking things into your own hands—could be much more effective. With Lakeman’s guidance, Eco-Village and about 150 volunteers set about converting their urban street into a public square. In one day their intersection was transformed into a giant mural, representing the beauty and history of the street’s local culture. A bicycle wheel with rainbow spokes acts as the center of the artwork, and flowers designed and painted by a young boy decorate a corner of the street. Around the intersection wraps a blue salamander, looking like the protector of the cross walks. The residents were taking back their street, saying beauty and nature doesn’t have to be sacrificed for functionality. Adult volunteers outlined the designs inspired by the wetlands of the area, and the kids, who made up about half of the volunteers, colored them in. 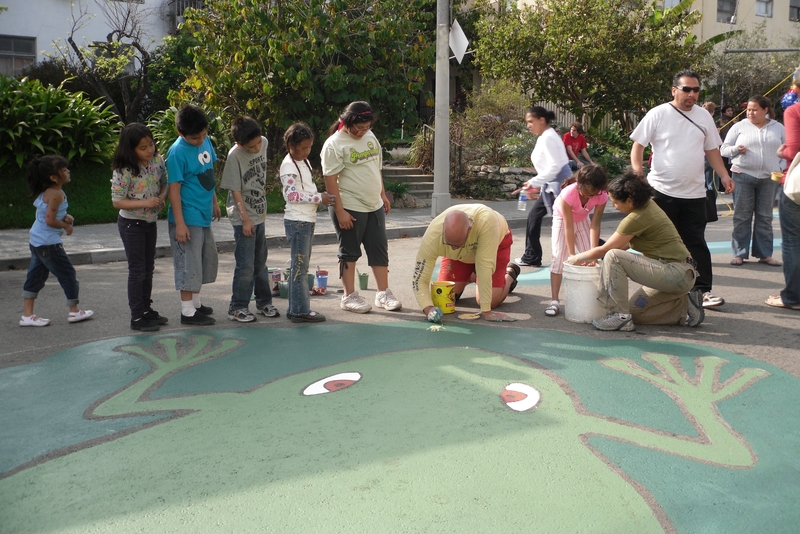 At the end of the day, many of the volunteers placed a hand print around a giant painted frog, representing the Sacatella Creek that used to run through the neighborhood. “We try to create our space as an ‘outdoor living room,’ making the street a place where people can come together and meet each other,” Linton said. Linton and his neighbors have created benches out front from broken pieces of concrete, giving the garden an urban but not overly harsh vibe. In between the cracks of concrete grows oregano. Ten years ago they also built a bench shaped like a lizard out off mud—straw, earth and clay. It was topped with a coat of linseed oil and they painted on green leaf-shaped scales. A few years ago some neighborhood kids were jumping on the bench and broke the tail off, but the bench remains usable today. Adults taking English classes at the junior high across the street buy Pupusas every Saturday morning from a food truck, and they often wander over with their lunch to sit on the Eco-Village benches. When the weather is nice, Eco-Village residents will sometimes have their weekly potluck out on the painted street. Not everyone attends every meeting and potluck, and Linton is one of the more active members of Eco-Village, who attends 60- 80 percent of the meetings. He is one of the strong unifying forces of the small community, known for his boundless enthusiasm, and delicious baked bread. One weekend afternoon, as Linton passes through the Eco-Village living room on his way out to garden, he stops to play for a bit with one of the youngest residents who has a small wooden flying toy. Linton converses with the little boy in Spanish as founding member Lois Arkin bustles around the room thinking of home improvement projects for the complex. Arkin credits Linton with setting a high standard for Eco-Village residents. “Joe is one of our most active members and has really been involved and invaluable in getting funds and projects going around here,” she said. “As you can see this is our mutual admiration society,” Arkin added with a smile. Oftentimes his activism work brings him closer to other people with the same interests, but Linton notes that it can sometimes break people apart as well. Before working for non-profits, Linton worked in hospitals, and did non-profit consulting on the side. It was clearly his passion, and so an old girlfriend encouraged him to do it full-time. They moved into Eco-Village together, but they eventually broke up because she felt Linton wasn’t putting the same amount of passion he put into his non-profit work into their relationship. Linton admits he can get caught up in an idea or project, and other people and goals, tend to fall by the wayside. But for most of his life, Linton imagined he’d eventually have a family and raise some kids. In a time when few people really get to know their neighbor, hiding behind tall shrubbery and painted fences, Eco-Village residents embrace the colorful community they are a part of. One of Linton’s most popular plants in his garden is his guyaba tree, which bores sweet, delicious fruit especially popular with Central Americans and Bangladeshis. The strong, distinctive smell of the plant wafts into the street, attracting people who climb Linton’s tree for the fruit. They often break branches, so Linton often needs to prune back broken pieces. One fall day in October, Linton was out in the front yard weeding his garden with his Eco-Village neighbor Aurisha Smolarski—clearing out the summer debris and making way for winter planting. The sun was out and the air was crisp, and it was the type of weather that makes people want to get out of their house. A young Filipina woman in a sundress walked up the garden path and asked in broken English if she could pick some leaves from Linton’s guyaba tree. She explained that she was pregnant—although she wasn’t showing yet—and, pointing to a rash on her legs, stated that she had allergies. She couldn’t take allergy medicine due to her pregnancy, and wanted to use the leaves to rub on her skin. Linton and Aurisha, who had never done anything with the guyaba tree except eat the fruit, looked at the woman skeptically. In response to their confused looks, the woman stated simply, “I’m Filipina,” as if that explained everything. Linton said she could take whatever she needed, and helped her harvest the leaves from branches from the sweet smelling tree. The woman left happily, and Linton was glad to have some of the overgrown branches cleared from the sidewalk. 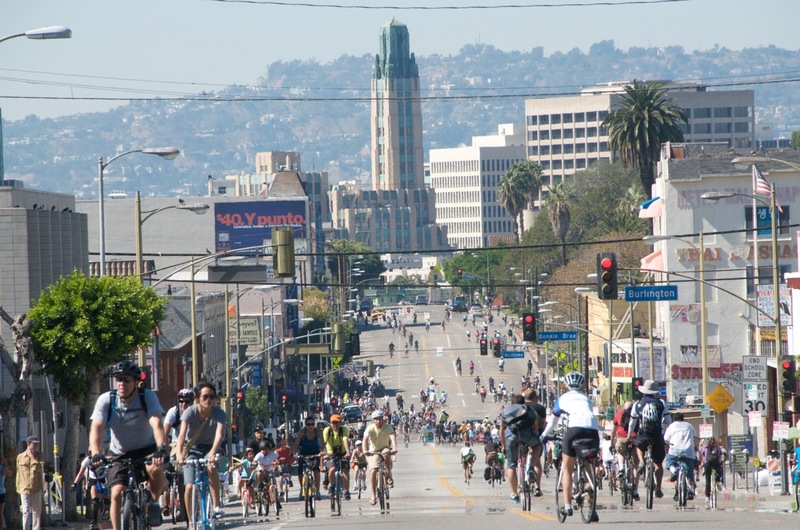 Sunday, October 10th CicLAvia closed seven miles of street, and declared it “car free” from 10am to 3pm. Linton hoped that the few hundred who said they’d attend would come. He’d been in the non-profit sector for many years, and in his experience, environmental causes weren’t very popular in LA. Linton thought back about the time he wanted to get a simple bike lane added onto the street. Most people didn’t seem to care. Businesses outright hated the idea. CicLAvia is meant to get people excited about biking. “What if it doesn’t work?” he thought. Working for the environment wasn’t always his calling, however. As a kid growing up in Tustin, California, Linton thought he’d one day be a doctor. The environment wasn’t something he thought about too much. He enrolled at Occidental College as a biochemistry major, since he was always good at science and math. Linton stopped school just shy of finishing all his credits and began working at a UCI medical center lab. He also took art classes at Art Center in Pasadena, and visited Los Angeles art galleries on his days off. He always had an interest in art, and drawing was his main hobby ever since he made posters for church events in high school and drew science fiction monsters with his friends during breaks at school. By the time he was out of college for three or four years, Linton became certain that being a doctor was not for him. After college, though, Linton continued to work in the medical field, working in a Long Beach hospital before transferring to Childrens Hospital of Los Angeles. By his late 30s, Linton was regularly giving tours of the Los Angeles River, and supporting efforts to rehabilitate the area. He decided to leave the medical industry for good when he got a job in government as an advisor to city council member Ed Reyes, who wanted to rejuvenate the LA River and recruited Linton as an expert in 2002. Eventually, Linton even wrote and illustrated a guide book for the river. Linton went on to work for Friends of the LA River, working on outreach and clean-ups. He moved on to another non-profit, Livable Places, before getting involved with CicLAvia. He’s happiest now as an organizer at CicLAvia, where he is in a relatively high leadership position, and is doing something that the city actually wholeheartedly supports. In the past Linton changed his various jobs once he began disagreeing too much with the people he worked with. Luckily, CicLAvia support continues to grow. 80,000 people came out to the April 10th event, and Linton is currently planning another one in October. 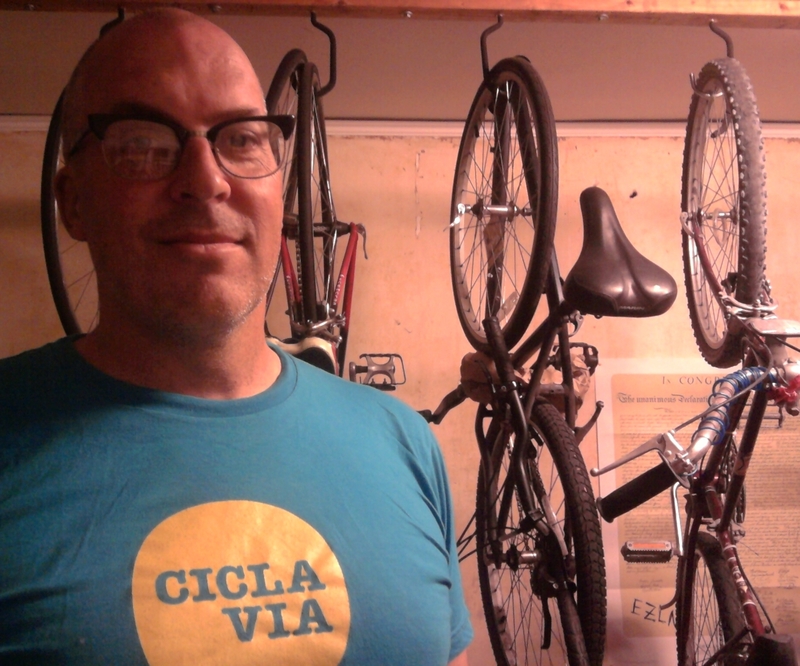 Since it is a young company, CicLAvia doesn’t have its own office, and Linton does most of his work from home. He hopes to eventually get the pile of CicLAvia t-shirts out of his living room, since a separation between work and home is ideal for him. When he’s doing work he really loves and believes in, the separation is already hard enough to keep. It’s hard to imagine he ever considered doing anything else. “In ten years I see myself working or running a non-profit, having built something very strong politically, whether it’s with rivers or bikes or whatever, involving people and changing lives,” he says. The inside of Linton’s apartment is messy and scattered, like a man who has many different things going on at once. The old wooden stairs creak as they are being used, and at the top is Linton’s airy, U-shaped apartment. The airflow is refreshing and the natural light is abundant in a thoughtfully laid out floor plan modern architects no longer bother trying to achieve. Linton and an ex-girlfriend had painted the archway leading into the main room a cheerful red and blue to give the otherwise white walls a pop of color. A mix of graphic art posters and Linton’s own artwork hang on the walls. A black and white photo of his parents cutting their wedding cake is hung prominently on a wall in the middle of the living room. He now lives alone, though friends will stay at his place for extended periods of time. Piles of paper—some thrown into boxes by a friend fed up with the mess—are stacked next to book shelves holding CDs, novels and sketchbooks. There are 58 sketchbooks in all, collected over the years, since Linton’s college days. There is no TV, but Linton can easily go next door to the communal meeting room and watch TV. Usually he’ll just watch things on his computer online, or read, or listen to the radio. Against the wall is his bike. Riding his bike everyday as his main form of transportation means he periodically breaks the frame of his bike, and needs to replace it once every ten years or so. Right now Linton is riding a red and white 10 speed Centurion. It belonged to his mother, who inherited it from Linton’s brother in the 80s. He hopes to upgrade soon from his mom’s old bike, mostly because it lacks storage space. Linton does a lot of poster and t-shirt designs for his non-profits. He still draws everything by hand, instead of using a computer, because he likes the look of splashes and blotches. It can be frustrating for the people he’s drawing for, since he can’t easily change the time on a hand-drawn poster the way someone working in Photoshop could. His medium of choice is India ink and water color. Linton is mostly self-taught. He usually sketches just with a pen, no pencils. His drawings come out imperfect, but he kind of likes it that way because it makes it more organic and folksy. In his sketchbook he recently drew a cityscape of a block of San Francisco buildings. At first glance, it’s an impressive replication, but if one looks closer, the angles don’t line up exactly, and the perspective is not realistic. Linton just started to draw one building sign in the middle of the page and went out from there. Most things in Linton’s life take a lot of planning, but his art does not. If you ask Linton to describe himself, one of the first things he’ll mention is that he is an artist. The art he does in his free time doesn’t really have a meaning or purpose, although he’ll have periods where he draws the same subject over and over, like contorted bodies or disfigured faces. He enjoys distorting his figures, not to make a statement, but just to test out how far he can go while still making it identifiable. When he’s not painting or riding his bike, Linton can often be seen in his garden. Late one Saturday afternoon he stands under his mulberry tree, picking off the ripe, slightly sweet and juicy fruit. Tonight he’ll write some articles for his blog about his recent trip to San Francisco, where he picked up some new ideas about bike initiative he can bring to LA. On Sunday he’ll need to help plan an extension of the bike route for the next CicLAvia event. But for now he’s tending to his garden, collecting his picked berries in the front pocket of his sweater so that he can add it to tomorrow’s morning cereal. As he picks, he’ll occasionally plop a fresh mulberry into his mouth. Linton enjoys the peaceful afternoons in his garden; an escape from the demanding organizations that bleed over the line between his personal and professional life. It can be tiring, but though he’ll always cherish his moments of relaxation, urban non-profits are his calling. Linton is many things, but perhaps most importantly he is a resident. As long as he belongs to a community, he will fight to make it a better place. Its really a great Article.I like your blog.Thanks for sharing so much personal information about Joe Linton.Its really a great person.Your blog provide great knowledge about Joe Linton to the viewers.Thanks Again.